Irate Eight is the fourth level of Sea Breeze Cove in Donkey Kong Country: Tropical Freeze. 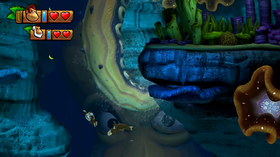 It is another underwater level, and also features the return of Squiddicus from Donkey Kong Country Returns. The music heard as soon as the Kongs enter the water is an arrangement of "Aquatic Ambience" from Donkey Kong Country and "Lockjaw's Saga" from Donkey Kong Country 2: Diddy's Kong Quest, which later dissolves into a full arrangement of the latter further into the level. The song that plays during the Squiddicus chase sequences, however, is an original composition named after the level, "Irate Eight". The start of the level is very similar to that of Amiss Abyss, as the Kongs begin in a cave before entering the water. This time, the Kongs can take a vine down or simply dive into the water. Common hazards found underwater include mines, which explode and release shrapnel if the Kongs get close to one, and spikes. Past the mines and spikes found shortly after submerging into the water, the Kongs will find a chain blocking the path, which can be broken through using a Corkscrew. After swimming past multiple Finleys, the Kongs will again find their path blocked by four mines. To clear the way, the Kongs must get close to the leftmost one to set it off, which in turn sets off a chain reaction, eliminating the rest of the mines. After passing through, there is a treasure chest that holds a flying banana, as well as three Mama Saws swimming back and fourth. To get past the fish, the Kongs must attack them from their vulnerable backsides, while they are facing right. The Kongs will then enter a current that lightly pushes them back, while also sending several mines floating towards them. The first checkpoint is found after the current. Shortly after crossing the checkpoint, a tremor causes several spike-covered rocks to fall from the ceiling. When the Kongs reach a wall with a DX Barrel, Squiddicus will suddenly appear from the background, tear down the wall with its arms and cause a flood of ink to rise from the bottom, forcing the Kongs to swim upwards. Along the way, they must dodge spikes, mines, large falling rocks covered in spikes, and Squiddicus' arms as they poke out from the side walls. Eventually, the Kongs must enter a series of timed Barrel Cannon launches, which lead them to the next checkpoint. Squiddicus can now be seen lurking behind the wall in the background, during which it will poke its arms through the wall and move them around in an attempt to hurt the Kongs. After passing the third checkpoint, the Kongs will launch out of two Barrel Cannons and arrive directly in front of Squiddicus, initiating another chase. While also maneuvering past falling mines, the Kongs must avoid Squiddicus' arms that wrap around the walls. Falling spike-covered rocks will then start to sink from the top, followed by arms poking through from the sides. As the Kongs approach the surface, Squiddicus will begin to push the two walls together. The Kongs will eventually reach a pair of Barrel Cannons that take them to the surface, where Squiddicus will meet them, and into another pair of cannons that are pointed at each other. Between the cannons, there are three large, chained mines swinging towards and away from the camera. The Kongs must launch out when the chains are aligned with the cannons to detach the mines and drop them onto Squiddicus. After all three mines have detached, Squiddicus will disappear into the water, and the Slot Machine Barrel will appear between the two cannons. K: Between two circling mines. O: Obtained by launching out of the moving Barrel Cannon once it is horizontally aligned with the next one. N: In the center of four Pufftups swimming in a circular motion. G: To the right of the falling mines in the second chase sequence. If the Kongs climb up the vine at the start of the level, they will find a Bonus Area. Collecting all of the bananas here reveals the Puzzle Piece. Above the four mines is a small alcove obscured by a wall, which reveals eight banana bunches upon entering it. Collecting all of them will make the Puzzle Piece appear in the center. Obscured by a wall to the right shortly after breaking through the chain during the first chase sequence. Above the first arm that moves 180 degrees, there is an entrance to another Bonus Area that holds the Puzzle Piece. Obscured by a wall on the right side above the arms that poke through the walls during the second chase sequence. This page was last edited on April 15, 2019, at 12:39.